Reserve Bank of India has declared the RBI JE Junior Engineer Result 2019 on the official site of RBI. 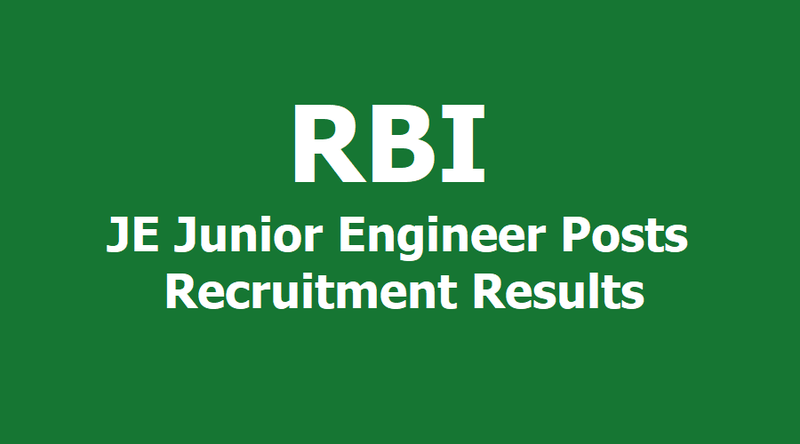 Candidates who have appeared in Junior Engineer (Civil/Electrical) posts can check their result through the official site of RBI at rbi.org.in. Candidates who are selected for the post will have to appear for the Language Proficiency Test, LPT to be conducted later. The examination is conducted to fill up 24 Junior Engineer in the Bank. Candidates who have cleared the examination will have to go for the document verification process. candidates are also requested to take a print out of the relevant proforma, duly complete them and send along with copies of above mentioned certificates to the Regional Director, Human Resource Management Department at the addresses of the respective Recruiting Zones given in the official notification within fifteen days of the date of publication/declaration of result. Payment of Examination Fees Online: 07.01.2019 to 27.01.2019. Tentative Date of Online Examination: February 23, 2019. Step 1: Candidates will have to visit the official site of RBI at rbi.org.in. Step 2: Click on Opportunities section available below. Step 3: A new page will open where candidates will have to click on the ‘Result section’ available on the upper tab. Step 4: Press the Junior Engineer result. Step 6: Download the pdf file and take a print out for further reference. The examination was conducted on February 23, 2019, and the list contains roll numbers of shortlisted candidates. A total of five candidates are selected for Junior Engineer (Civil) posts and one candidate for Junior Engineer (Electrical) post. Candidates willing to check for more information can visit the official site of Reserve Bank of India.